391 p., 14,8 x 20,5 cm. With contributions by Wolfgang Bonsiepen, Manfred Durner, Klaus Düsing, Dietrich von Engelhardt, Reinhard Heckmann, Bernulf Kanitscheider, Heinz Kimmerle, Hermann Krings, Reinhard Lauth, Rudolf W. Meyer, Francesco Moiso, Wolfgang Neuser, Wolfdietrich Schmied-Kowarzik, Manfred Stöckler and Nelly Tsouyopoulos. The newly awakened interest in questions concerning Natural Philosophy emphasize the modernity of Schelling’s »speculative physic«. 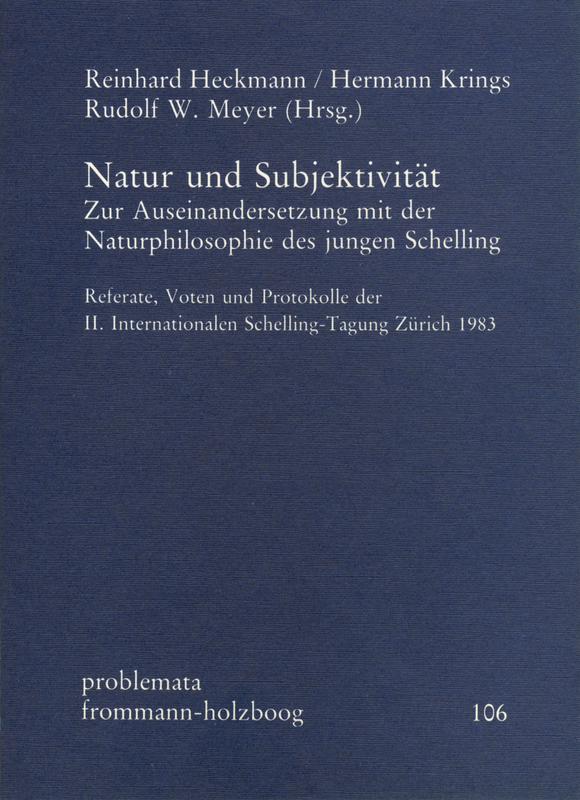 His early Natural Philosophy can be regarded as Schelling’s attempt to critically limit the scope of scientific/technical rationality in favour of a more comprehensive concept of rationality.